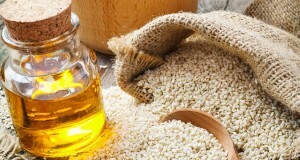 What are properties of sesame oil? For ages, sesame oil had special place in cuisine of middle and far east as an addition to many dishes. Since antiquity, sesame oil was known for its medical and conditioning properties, and that is why more and more willingly we reach for it in everyday skin and hair care. What are properties of sesame oil? What is this oil like? Let us introduce few information about sesame oil. Sesame oil is very light oil, obtained in process of cold pressing from sesame seeds. Colour of sesame oil can be various – from dark yellow, through caramel to even brown. It has soft, nutty scent and taste. 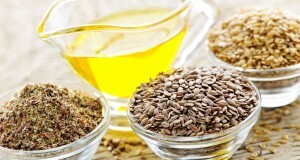 It is one of the most aromatic vegetable oils. 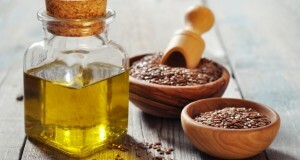 Stored in a dark and cold place oils from various types of sesame have one common quality – are really lasting and resistant to going rancid vegetable oils, which in low temperature can solidify. It is worth mentioning that this oil cannot be exposed to high temperatures, that is why it is unsuitable for heating. Sesame oil is one of the most diverse out of vegetable oils, which are used in cosmetology. It is that lasting because of two antioxidants – sesamin and sesamolin. It has also high concentration of tocopherol, i.e. vitamin E (also antioxidant). Sesame oil contains one of biggest dosages of linoleic acid (47%) with moisturising properties. On top of that, in sesame oil you will find vitamin complex (thiamin, riboflavin, niacin, folic acid, B6 and A), minerals (calcium, iron, magnesium, phosphorus, potassium, sodium and zinc) and fatty acids (saturated and unsaturated). Sesame oil is also rich in phytosterol. We can talk about properties of sesame oil for hours, but the most important thing is that this oil has medical and conditioning properties. In healing, sesame oil is used accordingly to Ayurveda, i.e. ancient Indian medicine. It is expected to detoxicate, strengthen, reduce pain, lower level of cholesterol and blood pressure, and even eliminate risk of skin cancer and other tumours. 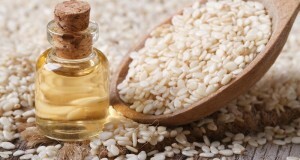 In cosmetology sesame oil is mostly used for its rejuvenating, moisturising and regenerative properties, but also for general skin and hair care. Sesame oil in conditioning – for whom? Cosmetic sesame oil for hair Copyright © 2019. All rights reserved.